What do a cello, a pipa, a shakuhachi, a gaita, a sheng and a kamancheh have in common? Aside from them all being musical instruments, they’re all found and played to perfection in Yo-Yo Ma’s Silk Road Ensemble. The latest effort from Oscar®-winning music documentary filmmaker Morgan Neville (20 FEET FROM STARDOM) profiles this musical collective from its inception 16 years ago in the Berkshire Hills of Massachusetts up to the present day, and gives audiences a brief glimpse into the back stories of five of its immensely talented virtuosi including Ma himself. Along the way, we are treated to some very special music coming from some instruments that most people have never heard of and being played in the most creative of ways. Our main narrator on this east-meets-west musical exploration is Ma, who tells us that as a child prodigy he never gave much thought about what he wanted from his music but, after performing for a half a century, he began to wonder about his place in the world. He recalled what famed composer and conductor Leonard Bernstein had said years earlier about how music is a universal language, and he felt that he could be a force to unite musicians, composers, artists and audiences to bring hope to the world. With the tragic events of 9/11 and the subsequent political upheavals throughout the Middle East, the impetus to seek common ground across diverse cultures and ethnicities became all the more urgent and, with that, the Silk Road Ensemble became something more than just a one-off get together of a bunch of eclectic musicians. As the group’s name suggests, the music, the instruments and even the musicians themselves all come from countries along the historic Silk Road. (Close to 60 artists make up the ensemble.) From the western end comes Cristina Pato from the Spanish region of Galicia, who plays the gaita (Galician bagpipes). Years earlier, Cristina had the reputation of being somewhat of a bad girl in her homeland because of her unconventional musical styling. Today though, she’s heralded by her people for reviving a dying tradition. From the central portion of the route come Syrian clarinetist Kinan Azmeh and Iranian kamancheh player Kayhan Kalhor. Both men are political exiles now living in the US. (Kalhor has returned to Iran from time to time but he has been barred from performing there.) From the east comes pipa player Wu Man, a Chinese expatriate who is often compared to Jimi Hendrix. Her early life, too, was influenced by political events that turned her country upside down. These four people recount their younger days and their attempts to find their own inner voices as well. While all these stories are interesting to listen to, and perhaps these are even people whom we’d like to hang out with over a coffee at Starbucks, Neville doesn’t fare too well trying to tie everything together into one emphatic final crescendo. It’s like we’re watching all the musicians warm up but we never get to see the concert. Sure, there are scenes of the ensemble in performance but they are too few and too short, and most often they focus on how much the musicians appreciate each other’s talent rather than what the audience thinks or who has been inspired by the musicians to go out and build their own bridges of hope. Who composes or arranges all the pieces? Who chooses the programs they perform? We’re not told. We see there’s a visual artist (Syrian émigré Kevork Mourad) but how did he get involved with them and are there other non-musicians in the group? Again, we don’t know. Most importantly, though, what are the ensemble’s educational activities? We do see the two Syrian artists visiting children who are living in Syrian refugee camps in Jordan and Lebanon but, again, the interlude is too brief and not enough information is told. Granted, there are probably so many stories here that Neville could have made a six-hour documentary but in keeping the film to just over 90 minutes, he left a lot out and kept a fair amount of repetition in. If the litmus test for making a good music documentary is whether the viewer will want to go out and buy the soundtrack album afterwards, then Neville and Ma have succeeded. There’s enough of the ensemble’s music to whet the appetite but it’s no more than just a nibble. 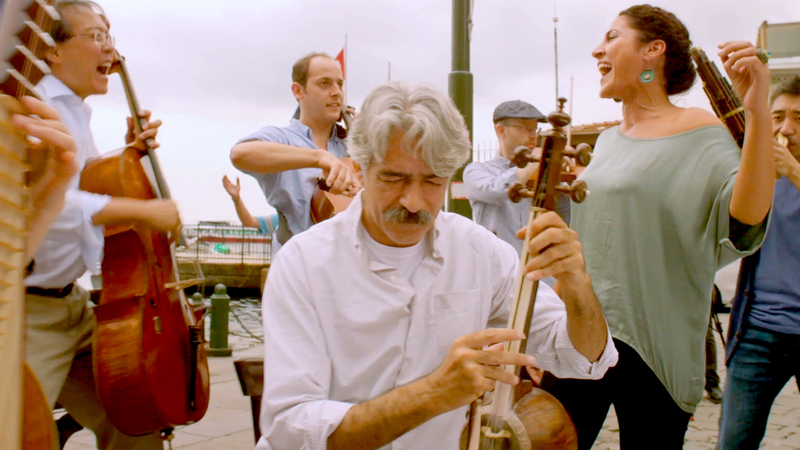 So, while THE MUSIC OF STRANGERS: YO-YO MA AND THE SILK ROAD ENSEMBLE succeeds overall, it’s neither as good as it could have been nor is it as good as what we have come to expect from the director. I saw the silk road perform at Massey Hall in Toronto. Don’t think a CD could replicate the sheer joy of watching and listening to this amazing group. I went not ever having heard of them..because it was yoyo ma and they had to be good. I don’t know that they’ve ever performed in HK (Yo-Yo Ma certainly has though) but if I ever hear that Wu Man will perform here, I will definitely buy a ticket. She is amazing!